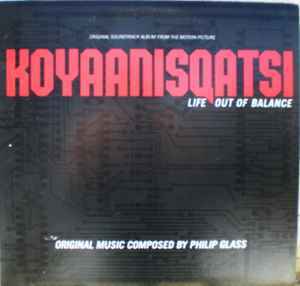 Philip Glass's Koyaanisqatsi was originally composed as a film score to the 1982 Godfrey Reggio film of the same name. The original 1983 album release of the soundtrack was edited down to 46 minutes to fit on a single LP. It was later issued on CD in the same, edited format. In 1998, Glass re-recorded and released the full score as a separate release. The complete original motion picture score (with sound effects) was released in 2009. The piece called "Pruit Igoe" was named after the notorious St. Louis housing project, demolished from 1972-1976. Reggio filmed one of the 1975 implosions. However, it was generally known as Pruitt-Igoe. As such, the title was misspelled in all releases until the expanded version was issued in 2009. See The Demolition of Pruitt-Igoe. Get a chance to see the film on big screen. And then listen to that music again at home! Why is the 1998 re-recording included in this master release? I have also noticed a change in timbre from "Vessels" onwards as if there has been a little post-production work done to the recording. This is perhaps one of the most apocalyptical opus ever made in the history of soundtracks, a requiem for the dream of man, and the man inside his own dream. The music made by the genius Phillip Glass is certainly touching in many ways, very descriptive and relentless, very poetic and at the same time hard as a rock. Simple but direct in its own minimalism. Koyaanisqatsi, the soundtrack for the movie of the same name by Godfrey Reggio, is a requiem for humanity, a narration of our unbalanced present life and a projection of our almost immediate future. A testimony of our fragility and easy fragmentation. A question for our crazyness and at the same time a natural explanation of the causes and effects of our natural destiny in the universe. The ways of modernity in its unaware moments of failure. This is the apocalypse. It doesn’t matter what we did, or what we thought, what we left unsaid, or undone. Or what we wanted, what we needed or loved, or hated. Will perish. And our memories would be just ashes in the wind, and in a couple of million years there will not be a trace of our existence, unless perhaps for a few rocks from our now presumptuous constructions. A must for the apocalyptic children of today. Let’s hear the apocalypse prefigured while we watch it happening through our windows.